Atlantic’s Oasis Series is the first line of retail water gardening products built to contractor standards. These exceptionally well-designed units feature heavy walled high density polyethylene construction, attractive rolled rims for strength and rigidity and stainless steel hardware - contractor grade equipment sized for the smaller water garden. Atlantic’s Pro Series stands apart, with heavy walled construction that resists warping and crushing, stainless steel hardware that eliminates corrosion. Oversized doors, weirs and fittings optimize pump performance. The Big Bahama line features innovative, practical design to minimize maintenance and callbacks, maximize pump life and time between cleanings. Fast Falls from Atlantic®. 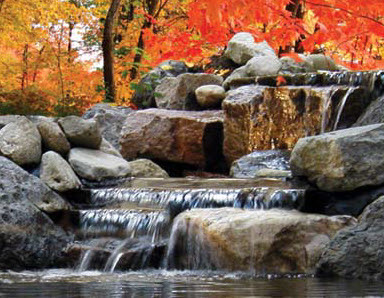 Four sizes to easily create waterfalls for your pond or stream. Easily add a waterfall or stream to an existing water feature Lifetime warranty on shell Includes bulkhead, liner tape, foam cube & grate for camouflaging Model: SP1400 Wa.. The universal waterfall diffuser is a fast and easy way to create professional looking waterfalls. Waterfall spillways are the perfect choice for Just-A-Falls (pondless) systems, signs, swimming pool features and other installations where a cascade of water is desired and filtration is not needed.. These incredibly strong one-piece units feature an internal baffling system, support cones and a reinforced spillway. The ‘inside the liner’ design plus rear liner attachment simplifies installation and liminates leaking. The top can be covered with rock, gravel, soil or mulch to blend seamlessly..
For formal water features and commercial installations the Natural Wonders PVC sheer cascade weirs are the best choice for durability and ease of installation. Heavy duty white PVC weir with 6" lip creates sheer waterfall and can be poured in concrete or built into pond or walls to create sh.. The Waterfall Spillway is a cost-effective solution to help create the starting point of a beautiful waterfall and stream. Spillway Width: 22" Bulkhead Port: Single 2" Bulkhead Fittings Included: 2" PVC slip, 1.5" barbed hose fitting and pre-installed bulkhead Max Flow Rate: 7,500 GPH ..
Atlantic’s spillway basins feature a pre-fi ltered pump chamber, one piece construction and built-in plumbing channels to create a perfect reservoir for formal spillway projects. Add an optional splash mat to reduce splash, conserve water and ensure your pump remains submersed at all times. Basin..
Give any water feature a natural look with the Filtrific® Waterfall Starter. Its versatile rock-bearing design neatly disguises it in any landscape, allowing only the water and natural elements to be seen. The WS1 waterfall starter takes the water that comes shooting out of the pipe at the t.. These are Atlantic’s original Acrylic Weirs that are used in their Colorfalls but these weirs have no lights and are used to create sheer fall effects where no lighting is desired. Of course, LED light strips can be added at a later time if you wish. Atlantic’sacrylic weirs are a perfect fit for ..
We supply authentic replacement parts for the Oasis™ and Pro Series FilterFalls™ from Atlantic Water Gardens®. By using authentic replacement filter mats and grates you will be able to replace any broken or worn parts of your Atlantic FilterFalls. Please ensure you are ordering the correct A.. The OASE Waterfall Spillway is ideal for creating small waterfalls or to start streams. It has an extended spillway lip to help make it easy to adapt to almost any small project. It is made of durable UV resistant high impact black plastic and has an inlet that will fit 3/4" or 1" pump hose. An i..